Does Car Insurance Cover Side Mirror Damage? It's one of life's small irritations that always seem to happen at precisely the wrong time. Damage to a car's side mirror is never major, assuming there's no other destruction involved. But it's always aggravating, if only because you have to consider this question: To claim or not to claim? Whether to file an insurance claim is not as easy a question as it might sound. Who pays for the repair of your broken side mirror depends on how it was broken and who broke it. 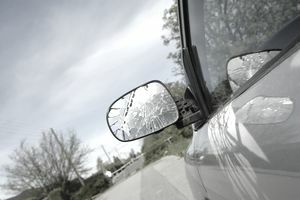 Say the mirror was broken in a minor collision with another vehicle that was caused by your negligence. Or, the mirror clipped a tree in your own front yard while you were backing out of the driveway. The answer in both situations is relatively simple. Either you or your insurance company or both are going to pay. Your insurance will pay some of the repair cost if you are carrying collision coverage at the time of the accident and you have a deductible that is less than the cost of the repair. If you don't have collision coverage, you will pay the full costs to repair any damages to your vehicle in an accident caused by you, including damage to your side mirror. If you have collision coverage, you will have to pay any deductible amount before your insurance kicks in. If the only damage is to the side mirror, there's a good chance that the bill will be less than your deductible. Side mirror replacement generally costs somewhere between $130 and $330 including parts and labor, although it can cost more than $1,000 on some luxury models. If the damage was someone else's fault, you're in luck. You can file a claim against the other driver's insurance policy, get an estimate or two, have it repaired, and the other driver's insurer will cut you a check. If you have collision coverage, you can file a claim with your own insurance provider while you are working out the details with the other driver’s insurance company. You'll get at least some of the cash needed for the repair more quickly. Your company will take care of getting reimbursed. It gets complicated if the damage was caused by a hit-and-run driver, or if the other driver doesn't have insurance. You can file a claim with your own insurance company if you have uninsured motorist coverage. If you don't, you'll be paying for the repair yourself. It’s especially important to file a police report on a hit-and-run incident. Some insurance companies require it in order for your claim to be considered a chargeable loss. If none of the above scenarios apply, you've probably been the victim of theft, vandalism, or what the insurance companies call an "act of God." That would be an event that is beyond the capabilities of mere mortals, such as a hurricane or a lightning strike. These are the events for which insurance companies created ​comprehensive coverage. Like collision coverage, comprehensive coverage is optional in most states if a car is paid off. If you have comprehensive coverage and your mirror is stolen or broken by a vandal or by the wrath of nature, you can usually file a claim with your insurer. You need to check your policy, though. Comprehensive insurance sometimes omits damage from specific natural disasters in areas that are prone to them. Even if you have comprehensive insurance, don't forget about that deductible. You'll be liable up to that amount before the insurance kicks in. Who's Liable to Pay for the Repairs If a Ball Hits Your Car?